Drawing and Pictures of the arrangement used to turn a drum full of dry wood into charcoal while burning off the noxious gasses. This afternoon I tested a scaled up version of the venturi burner. high production of polluting gasses. 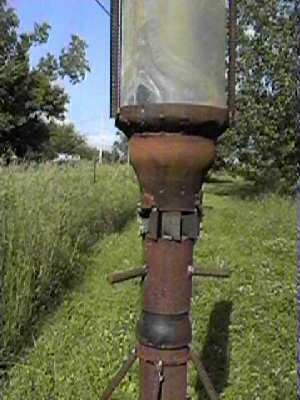 Much of this chimney flare was built out of heavy steel because that is what was available. There is no reason why the whole chimney couldn't be made out of sheet metal stove pipe. Note the tangential fins which act as guides for the secondary air. if all goes well, will be self sustaining in the chimney above. under cover in this region. the lid and chimney assembly were erected. 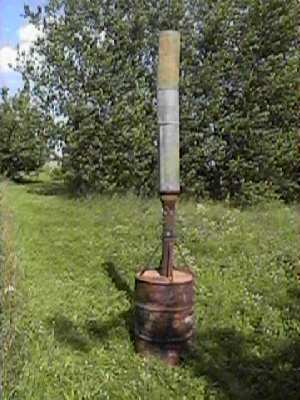 the pyrolysis gasses out of the drum, and a 150 cm tall, 20cm. dia. the top of the short chimney. The charcoal looks good. To bad it isn't hardwood. This device had a heat output in the range of 200,000btus/hr for three hours. We ought to be able to use that for something useful.